Bill Gates and Warren Buffett made the headlines a few times last year, asking America’s wealthiest to donate the majority of their wealth to cause/s of their choice, whether during their lifetimes or laid out in their wills. To further encourage billionaires to make such a commitment, Gates and Buffett created the Giving Pledge. 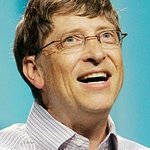 In his 2011 Annual Letter posted on the Bill and Melinda Gates Foundation website, Gates says that 58 people have joined the Giving Pledge so far, and top business people in China and India have also shown interest in the idea and called for meetings.